Explore the stunning region between the Belgian coast and the fascinating city of Bruges on this trip that is perfect for families. With glorious beaches, shopping and cultural heritage, there are a host of attractions waiting to be discovered. Easy to navigate cycling paths take you along breathtaking coastal regions and through unspoilt countryside, and the trip is suitable for all ages and abilities. After arriving to Bruges you will have the day at leisure to enjoy this beautiful city. Distinguished by its canals, cobbled streets and medieval buildings, it's a delight to explore on foot or by boat by taking a cruise on the Reien River. The city has an almost fairy tale like quality, with its historic churches and soaring towers, and yet it is also a modern city with stylish boutiques, cafes and restaurants. There is plenty to do for families, from the Boudewijen Seapark with its dolphins and rides to the fantastic chocolate museum, "Choco Story'. You can also take a romantic carriage ride through the historic centre to see the famous market place and 13th century belfry, which has a panoramic view from its 83 meter high tower. Today's ride is to the lovely coastal town of Ostend. The first stop will be in De Haan, a beautifully preserved "Belle Epoch' style 19th century village, where you will have time to explore. Carrying on, you will soon arrive to the picturesque coastal town of Ostend, known as the "Queen of all coastal towns', where you will be able to check in to your hotel and enjoy a relaxing afternoon. The hotel is located close to the beach and has a playground and bouncy castle. For those wanting to explore there is plenty to do, from museums and farm parks to a stroll along the impressive promenade. Today's ride is a circular route, riding through the unspoilt countryside of the Polder landscape. A visit to Oudenberg makes for a fascinating stop, this typical Flemish village is built on the remains of an ancient Roman city and has lots of history to discover. You will then ride back to Ostend for another enjoyable afternoon by the beach. Today you will visit the coastal town of Nieuwpoort, one of the most popular seaside resorts in Belgium. The small town is situated at the mouth of the River Yser and played an important strategic role during the first world war. You will have a chance to visit the wide, sweeping beach and Ysermonde nature reserve, as well as the charming harbour. A ride back along the coast will give you an appetite for dinner when you arrive back into Ostend. Today you will cycle back to Bruges, passing typical Belgian villages as you wind your way through the picturesque landscape. You will pass the famous silent canal and the renowned watersports centre of Spuikom. Today you will ride to the bustling seaside town of Blankenberge to spend the day at the beach or visit the impressive sea life marine park, where you can discover fascinating sea creatures including sharks and piranhas. 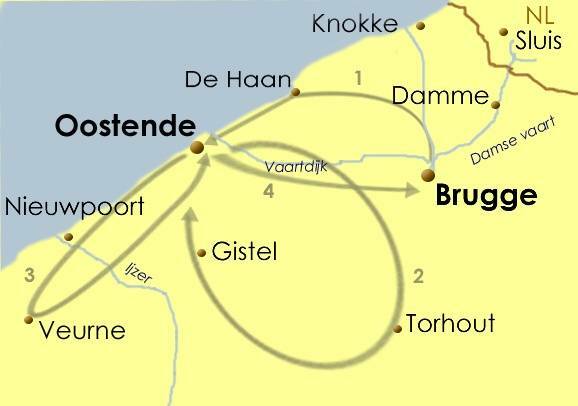 After an exhilarating day you will ride back along the coastline back to Bruges to enjoy your last evening in Belgium. After breakfast you will check out of the hotel and make your way to the airport for your journey home. The Bruges and the Belgian Coast cycling holiday includes the daily transfer of luggage to the next hotel and local support if required.